We field tested dozens of designs to perfect this performance bike multi tool. Designed for both road and mountain biking, this tool will be your sidekick both on and off the trail. Non-slip textured sidebars give you grip in the wet. 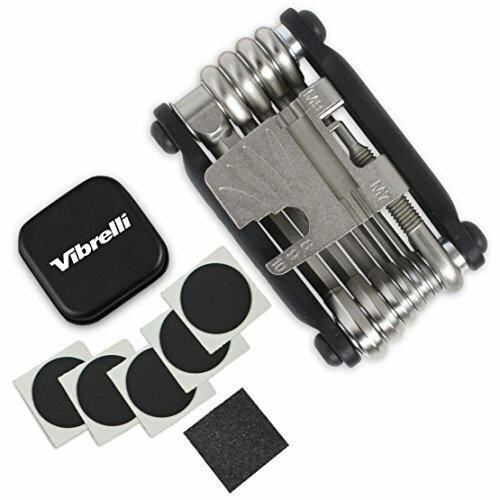 19 Precision Bike Tools: Hex (2, 2.5, 3, 4, 5, 6, 8), Universal Chain Breaker Tool, Spoke Wrenches (M7, M9, 3.3mm, 3.45mm), Open Wrenches (8mm,10mm) Phillips Screwdrivers (#1,#2), flat (#2), Torx (t-25), With Non-Slip Sidebar Grips. Includes: Glueless Puncture Kit & Multi Tool Carry Case, be prepared anywhere! Meets Military Grade MIL-STD 810G: This Bike Tool can take a beating! Built to Last: Made from Hardened High-Tensile Cr-V Steel, and comes with Lifetime Manufacturer's Warranty.